At the headwaters of the Tamor Basin in eastern Nepal is an unnamed glacier that terminates in an expanding glacial lake. The glacier is referred to as “Nobuk” Glacier here in reference to the nearby named peak on the map. The glacier is upstream of a Chheche Pokhari a lake formed by a glacier outburst flood in 1980. Two arms of the glacier both avalanche fed from the steep border peaks with Tibet. ICIMOD has recently finished a detailed inventory of glacier change in Nepal since 1980. In the Tamor basin they indicate glacier area from 2000 to 2010 has declined from 422 square kilometers to 386 square kilometers. 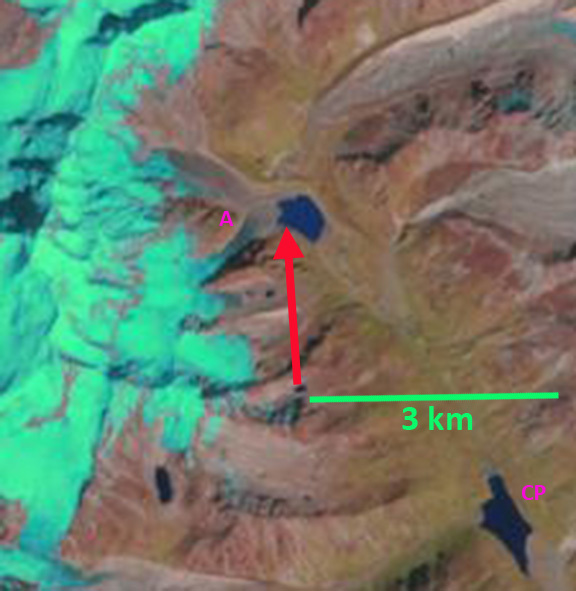 Here the glacier is examined from 1989 to 2013 using Landsat images. 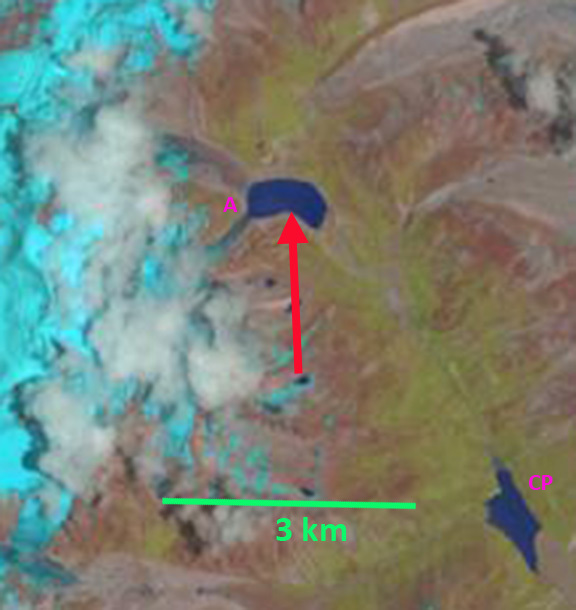 In 1989 the lake had several developing areas amidst the decaying glacier ice, but the glacier still reached to the far eastern shore of the lake. 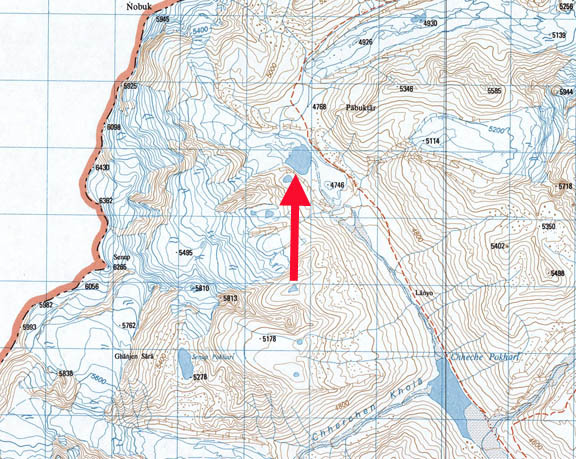 By 2000 Nobuk Glacier terminates at a southeast turn on the south side of the glacial lake it terminates in, red arrow, 500 m from the 1989 terminus. The glacier is fed by two arms, the southern arm has a steeper icefall near the terminus and is narrower. The two arms of the glacier are separated by a buttress, marked with a Pink Point A. This buttress is 750 m from the debris covered ice front. By 2009 the glacier two arms of the glacier are separate and the southern arm no longer reaches the lake. The glacier front has retreated back to the base of the buttress at Point A. 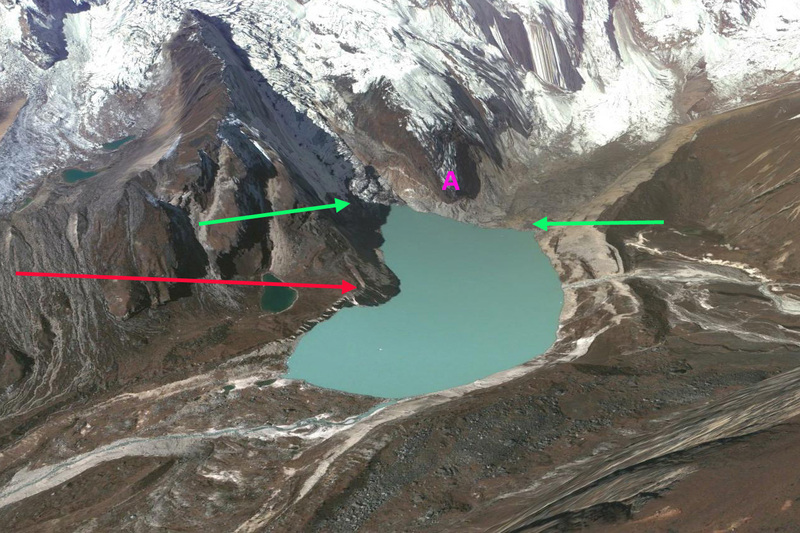 By 2013 the lake has more than doubled in length and area since 2000, red arrow at 2000 terminus in each image. 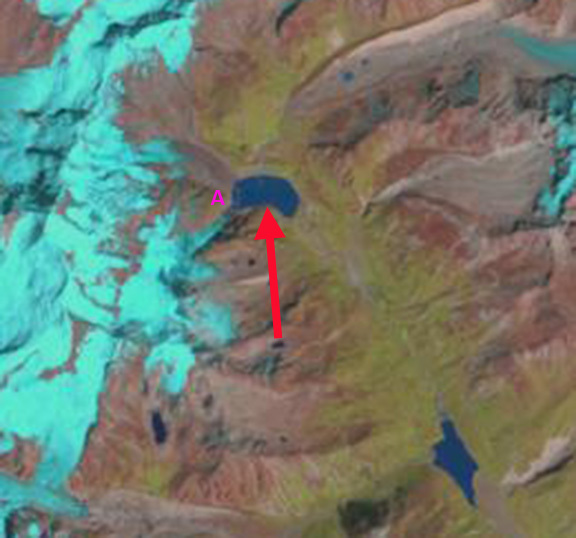 The southern arm terminates 150 m from the lake and the debris covered northern arm, though still ending in the lake, it is a very thin low slope terminus that appears to be close to retreating from the lake basin that the glacier has carved. This is evident in the 2010 Google Earth image. 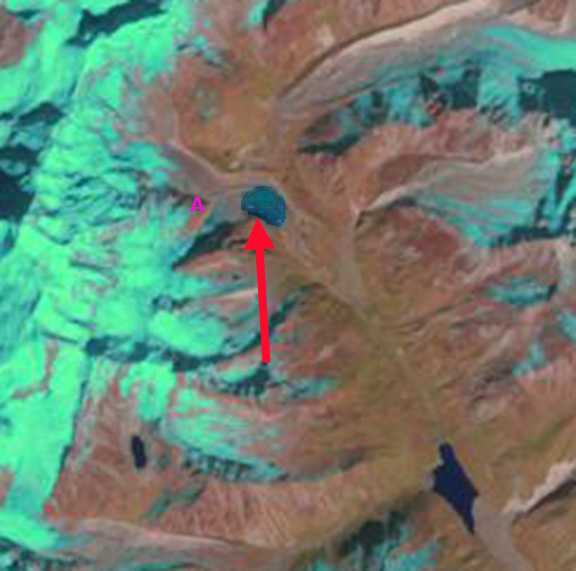 The glacier has retreated 500 m from 2000 to 2013. The lake is now 1 km long and has an area of 0.4 square kilometers. The retreat matches that of most Nepal glaciers. 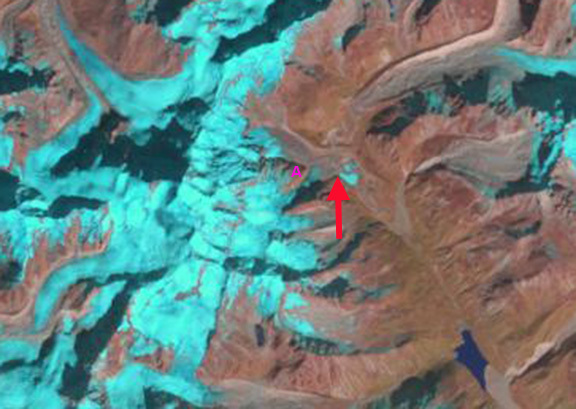 This glacier was noted as shrinking from 2.3 to 1.4 square kilometers in area from 1980-2010 by the ICIMOD glacier inventory, they documented a 24% loss in area and 29% in volume during this interval For Nepal’s glaciers. Individual glacier such as Lumding, West Barun, Imja, and Ngozumpa. 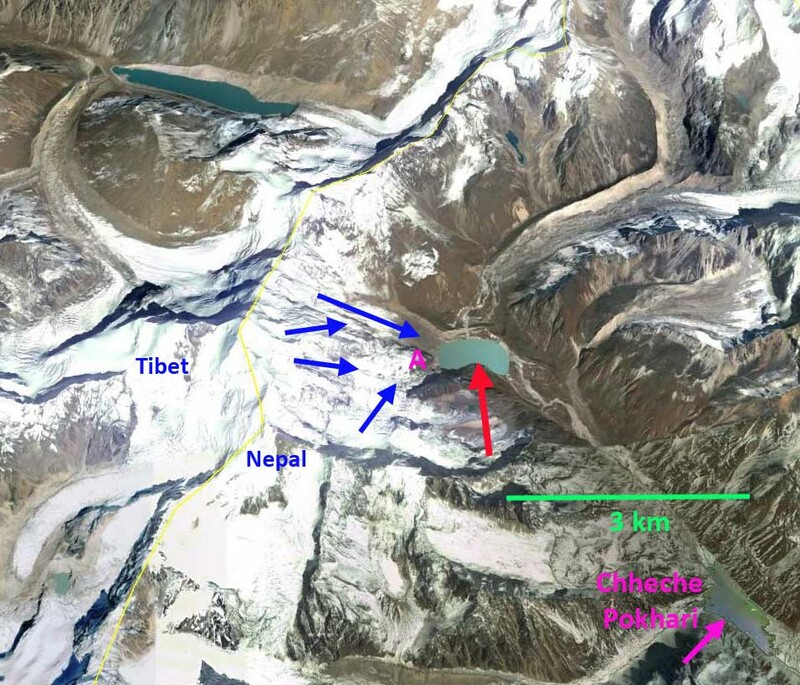 This entry was posted in Glacier Observations and tagged nepal glacier retreat, Nepal glacier separation, Nobuk Glacier retreat, Tarom glacier basin Nepal. Bookmark the permalink.